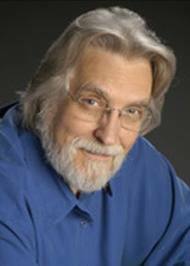 Neale Donald Walsch, author of the Conversations With God series and many other books, began his communication with God in 1992. It was during a difficult time of his life when everything (personally, professionally and emotionally) was going wrong. He began to write an angry letter to God questioning Him on why nothing in his life was working and when he had finished, to his surprise, the pen began moving on its own and an answer came through. A conversation had begun. Over time Neale asked many questions and he was told that it would become a series of three books. The first of these 'Conversations With God Book 1 - An Uncommon Dialogue' was published in 1995. 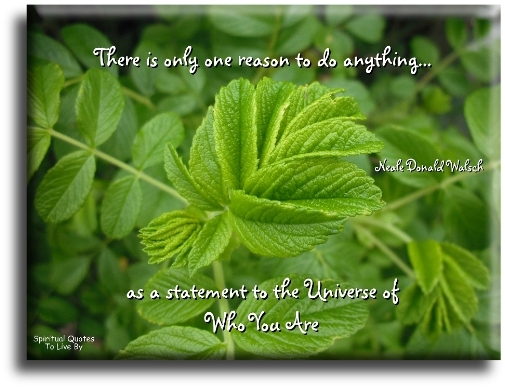 Since then Neale Donald Walsch has written many other books and a movie 'Conversations With God' was made of his story in 2007. A person can either do something in order to 'be happy,' or a person can start the day by simply deciding to 'be happy,' and the things that person will do will automatically reflect that. All of life is a conversation with God. All people are special and all moments are golden. There is no person and there is no time one more special than the other. 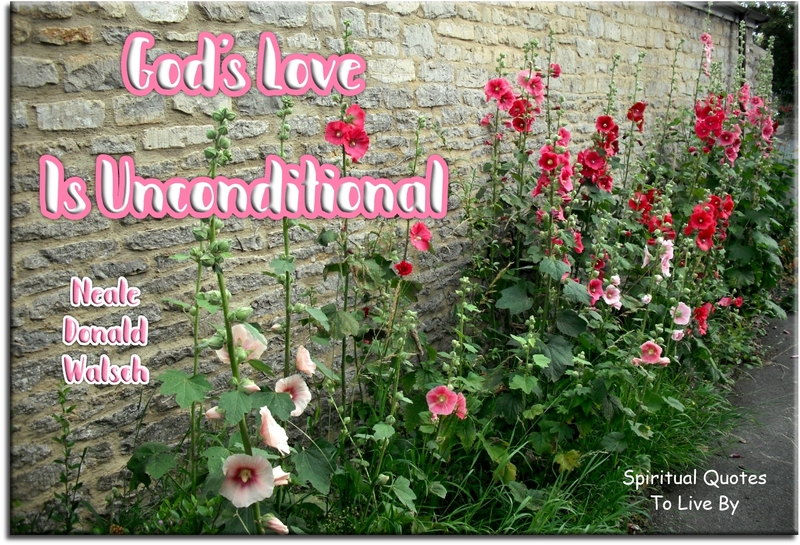 Many people choose to believe that God communicates in special ways and only with special people. This removes the mass of the people from responsibility for hearing my message, much less receiving it, and allows them to take someone else's word for everything. Build your schools around concepts, not academic subjects: core concepts such as awareness, honesty, responsibility, freedom and diversity in oneness. 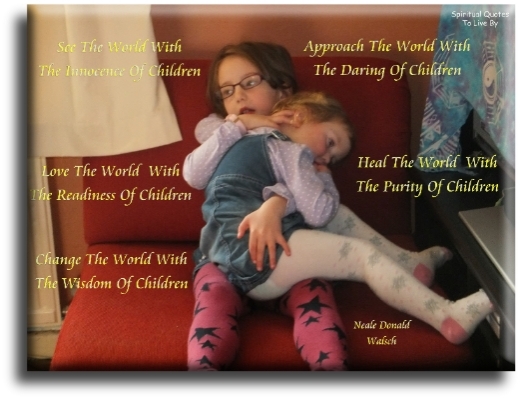 Teach your children these things and you will have taught them grandly. Then change your idea about it. About you. Think, speak and act as the God You Are. Don’t dismiss synchronicity of what is happening right now finding its way to your life at just this moment. There are no coincidences in the Universe, only convergences of will, intent and experience. Every action taken by human beings is based on Love or fear. Feeling is the language of the Soul. If you want to know what's true for you about something, look to how you're feeling about it. 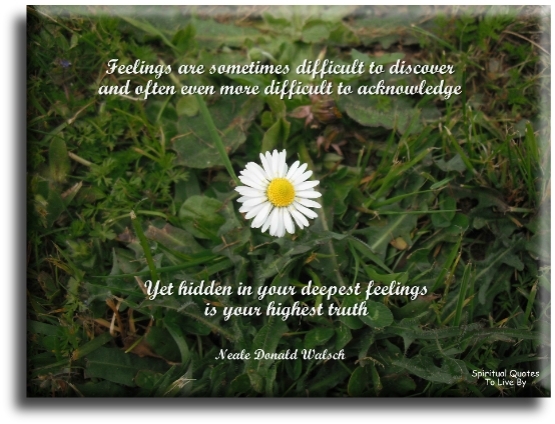 Feelings are sometimes difficult to discover, and often even more difficult to acknowledge. Yet hidden in your deepest feelings is your highest truth. God is communicating with us all the time. God is life, and the stuff life is. God needs nothing and therefore requires nothing from us. Human Beings consist of three distinct energies. Call forth a new reality. Think a new thought. Say a new word. Do a new thing. In Highest Truth, Love is all there is, all there was, and all there ever will be. When you move into the absolute, you move into Love. In the absence of that which you are not, that which you are, is. It is not God's function to create or uncreate, the circumstances or conditions in your life. God created you, in the image and likeness of God. You have created the rest, through the power that God has given you. It is you who are choosing, in any moment, to be happy or choosing to be sad, or choosing to be angry, or forgiving, or enlightened, or whatever. You are choosing. Let this Christmas Day remind us that Christ came to invite us to offer love to ALL humankind and to open the door of God's Kingdom to every Soul. Life is an ongoing, never-ending process of re-creation. 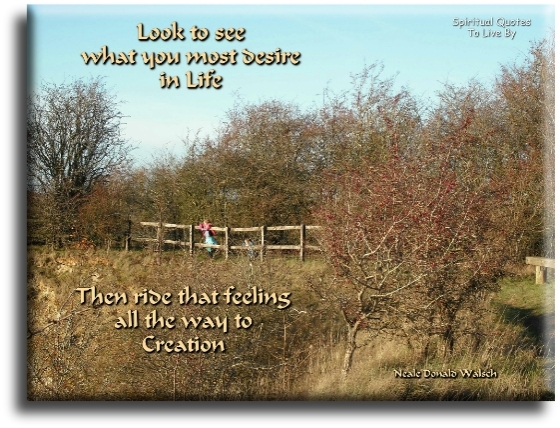 Look to see what you most desire in your life, then ride that feeling all the way to creation. Love is the ultimate reality. It is the only. It is the all. The feeling of Love is your experience of God. Masters are those who have chosen only Love. In every instance. In every moment. In every circumstance. Even as they were being killed, they loved their murderers. Even as they were being persecuted, they loved their oppressors. Mine is always your highest thought, your clearest word, your grandest feeling. Anything else is from another source. The highest thought is always that thought which contains joy. The clearest words are those words that contain truth. The grandest feeling is that feeling you call love. Passion is not expectation and expectation is not passion. 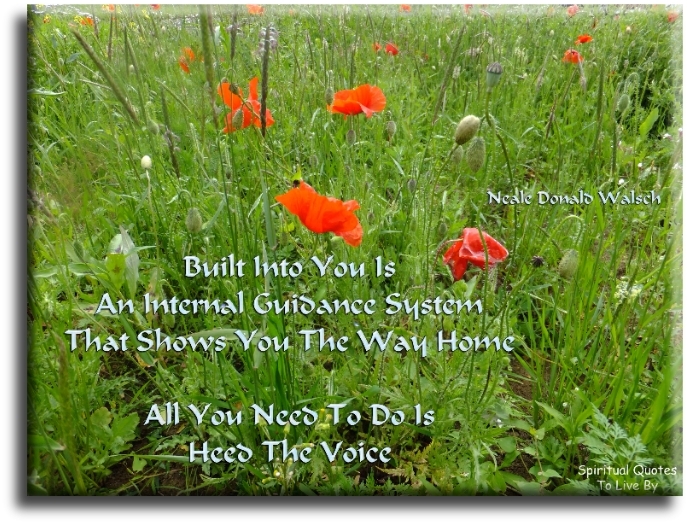 The best and quickest way to achieve all our goals and to live the life of which we have dreamed is to assist others in achieving their goals and living the life of which they have dreamed. The deepest secret is that life is not a process of discovery, but a process of creation. You are not discovering yourself, but creating yourself anew. Seek not to find out who you are, seek to determine who you want to be. The purpose of the Soul is evolution. There are no victims in the Universe, only creators. The Masters who have walked this planet all knew this. There are two sponsoring thoughts: fear and love. There is only one emotion, one energy, in the Universe... the energy, the emotion that we call Love. When you KNOW this, everything changes. As a statement to the Universe of who you are. Thought is the first level of creation. Next comes the word. Everything you say is a thought expressed. It is creative and sends forth creative energy into the Universe. Words are the second level of creation. Next comes action. Thought, word and deed are the three levels of creation. To want something is to push it away from you. What you fear, you attract. When you give your children knowledge, you are telling them what to think. 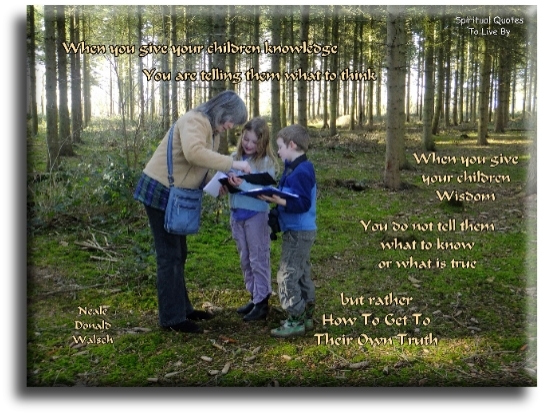 When you give your children wisdom, you do not tell them what to know or what is true, but rather how to get to their own truth. Words may help you understand something, but experience allows you to know. Never ever trade your own experience for someone else's words about anything that is really important... like God, for instance, or Love, or what is true about another. You are a Human BE-ing. You are a part of the body of God. You are always and forever in the moment of pure creation. So create who and what you are, and then experience that. 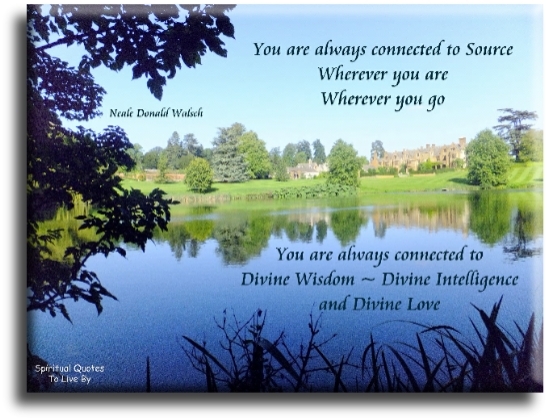 You are always connected to Source. Wherever you are, wherever you go, you are always connected to Divine Wisdom, Divine Intelligence and Divine Love. You are always in the process of creating. Every moment, every minute, every day. You are a big creation machine and you are turning out a new manifestation literally as fast as you can think. You are doing something very sacred here, something very daring, during your life upon the Earth. You are defining yourself, and then creating yourself anew, in each golden moment of now. You are not on this planet to produce anything with your body. You are on this planet to produce something with your Soul. Your body is simply and merely the tool of your Soul. You are not the flower, nor are you the fruit. You are the tree and your roots are deep, embedded in God. You are your own thoughts about yourself made manifest. You do not live each day to discover what it holds for you, but to create it. You are creating your reality every minute. You will not have that for which you ask, nor can you have anything you want. This is because your very request is a statement of lack, and your saying you want a thing only works to produce that precise experience - wanting - in your reality. Your health is your creation. Your life is not about your body. Your own life is the way it is because of you, and the choices you have made, or failed to make. Your purpose in life is to decide and to declare, to express and to experience WHO YOU REALLY ARE, this is the purpose of all life, that is evolution. There is also a page of the Core Concepts from Conversations With God, along with some verse that I wrote based on them.